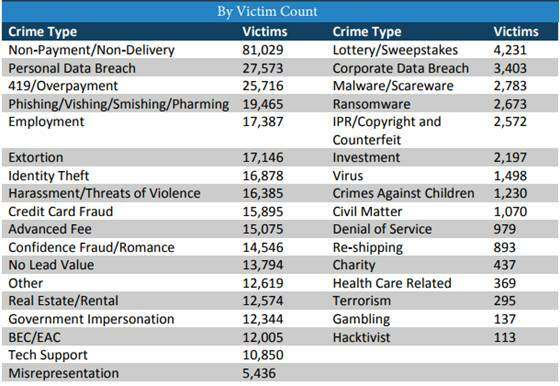 The leading crime types, ranked by reported losses, in IC3’s report were Business Email Compromise/Email Account Compromise (BEC/EAC), romance and confidence fraud, and non-payment and non-delivery scams. In the report, BEC/EAC had the largest losses at over $360 million with approximately 12,000 victims. BEC scams target business working with foreign suppliers and/or those who make wire transfer payments. The primary destinations for most of these fraudulent funds end up in banks in China, Hong Kong and the United Kingdom. What to look out for: An example of the scam occurs when a victim is duped into transferring funds to an account from a legitimate looking email from a CEO or CFO. According to the FBI, “The scam is carried out by compromising legitimate business e-mail accounts through social engineering or computer intrusion techniques to conduct unauthorized transfers of funds.” In the report, IC3 combined Email Account Compromise (EAC), a scam requiring the wire transfer payments, with BEC because of their strong similarities. 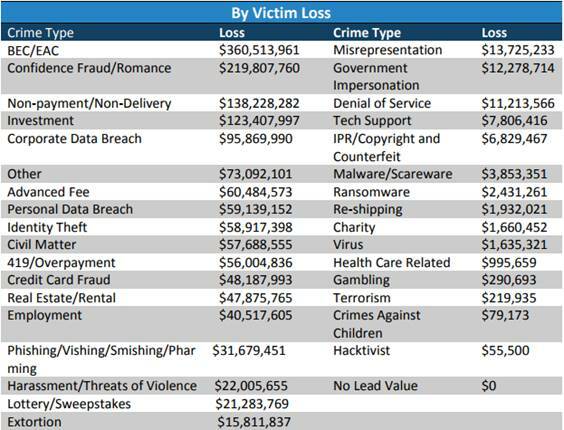 Confidence Fraud/ Romance scams were reported to be the second highest in victim losses - almost $220 million with nearly 15,000 victims (2,500 more over the prior year). Scammers establish relationships with the victims, gaining their trust and love without ever meeting them in person. Victims are typically older widowed or divorced women that are also educated, but emotionally vulnerable. Scammers prey on the information victims post on dating sites or social media to find their targets; sometimes keeping journals on victims. Romance scammers tell victims that they are in construction working on projects outside the U.S. making it easy to avoid meeting in person. Eventually the scammer asks for money because of a medical emergency or legal fee promising to pay the victim back at once. After the victim is convinced and provides the funds, they are never repaid. 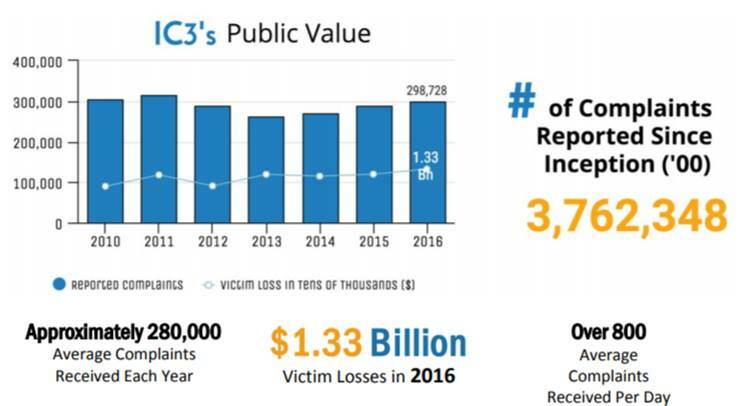 IC3’s 3rd highest reported loss was Non-Payment/Non-Delivery reporting over $138 million among over 81,000 victims. Fraud occurs when either a seller doesn’t ship a promised item after it is purchased or a buyer doesn’t pay for an item after it is shipped or service is rendered. Internet auction fraud is a typical scheme for non-delivery of merchandise, in which a buyer makes a payment for an item but the item is not shipped. Oftentimes, the sellers will relist the item and sell it again under another username. Non-delivery can also occur in the form of affiliate opportunities from web-based companies to sell expensive electronics at low costs such as televisions. The affiliates sell the items and send the funds to the web-based companies without ever receiving the items they sold to give to the buyers. If you suspect fraud or if you’ve been victimized, reach out to IC3 and get their investigative process going. According to their report, IC3 is focused on giving the public “a reliable and convenient reporting mechanism to submit information to the FBI concerning suspected Internet-facilitated criminal activity, and to develop effective alliances with industry partners. Information is analyzed and disseminated for investigative and intelligence purposes, for law enforcement and public awareness.” The IC3 accepts online Internet crime complaints from either the actual victim or from a third party to the complainant through their homepage on www.ic3.gov. For more articles related to cyber intelligence, fraud, and cybercrime, follow @Omniangle on Twitter or go to www.omniangle.com.